MommaSaid | She Called Me the "S-Word." If She Only Knew. Browse: Home / 2009 / October / 19 / She Called Me the "S-Word." If She Only Knew. She Called Me the "S-Word." If She Only Knew. She saw the whole thing. “So, first you dropped off brownies in your son’s classroom,” my friend Joan said when I ran into her in the school hallway on Friday. I know what it looked like. I’d actually made brownies from scratch for my son’s birthday celebration in school, but a real Super Mom would have made sugar-free carrot cake. Yes, I’d mentioned to one of the kids on the soccer team that I coach how well he’d played the previous weekend, but I am just an assistant coach. The head coach has way more responsibilities and clout. And besides, Joan was going to the same meeting. Though it was, indeed, snowing here on Friday, it was only October 16th, so I decided these weren’t appropriate. Plus, I didn’t have enough for the whole class anyhow. 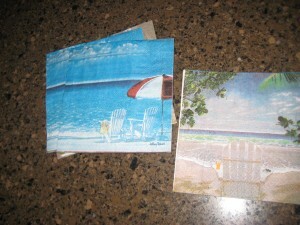 Same goes for the summertime-themed napkins. 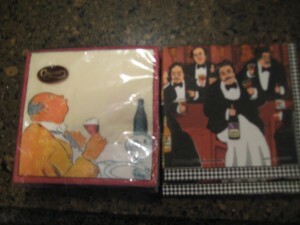 Perhaps the napkins with gentlemen imbibing wine doesn’t belong in the 5th grade? 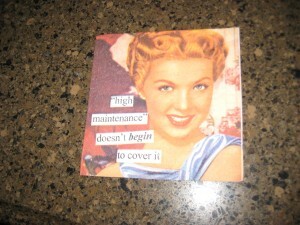 While “High maintenance doesn’t even begin to cover it” might amuse the teacher, who no doubt has her share of difficult parents, I nixed the idea. 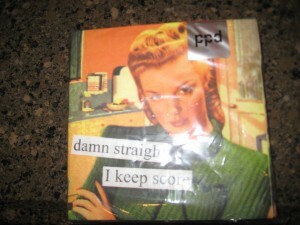 This one even has a mild curse word in it that the M.P.A.A. would flag while rating movies aimed at children. 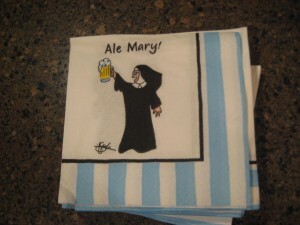 This one, a gift from a friend, seemed only appropriate if, say, we were to invite clergy over for the Giants game. And yet, we never watch football. In the end, I threw some plain white napkins in a bag and handed them to the teacher shortly before I ran into Joan. When she accused me of being a Super Mom, I started to protest, but she cut me off. “It takes the spotlight off the rest of us,” Joan said. 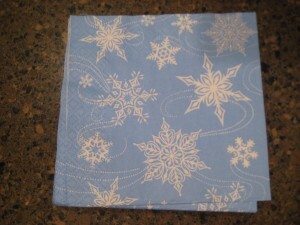 I imagined her own napkin collection, and I shut my mouth. Jen Singer, you give me hope that, once my 6 month old is school age, I actually WILL survive motherhood. Definitely with my sense of humor, possibly with my sanity, intact. 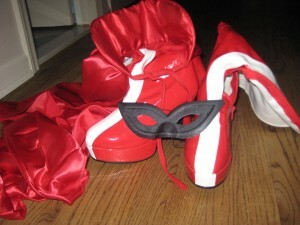 Wow, look at those boots! You really *are* Supermom.